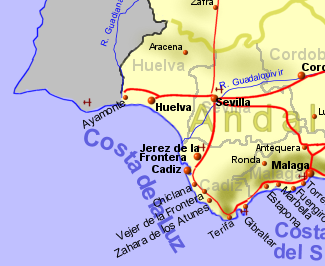 The Costa de la Luz extends along the Atlantic coastline of the Andalucian provinces of Huelva and Cadiz, from the straights of Gibraltar to the Portuguese border, featuring long beaches of golden sands. The name comes from the crystal clear blue skies giving a light which has been much appreciated by artists. This costa is largely undeveloped part of Spanish coastline, though some areas are popular with surfers and windsurfers. Terifa, on the southern tip of Andalucia is particularly popular with windsurfers and lies only 13 Km from north Africa with the Rif Mountains of Morocco visible. Further up the coast is the old town of Chiclana de la Frontera and the nearby resort of La Barrosa and the city of Cadiz. Occupying a large part of the area between the cities of Cadiz and Huelva, lies Spains largest National Park, the Parque Nacional de Doñana, important for its salt marshes, sand dunes, and brushwood areas, and the wildlife they support, while further south can be found the Los Alcornocales Nature Park, one the worlds largest cork oak forests. Beyond the city of Huelva, up against the Portugese border, is the old town of Ayamonte and the nearby modern resort of Isla Canela.